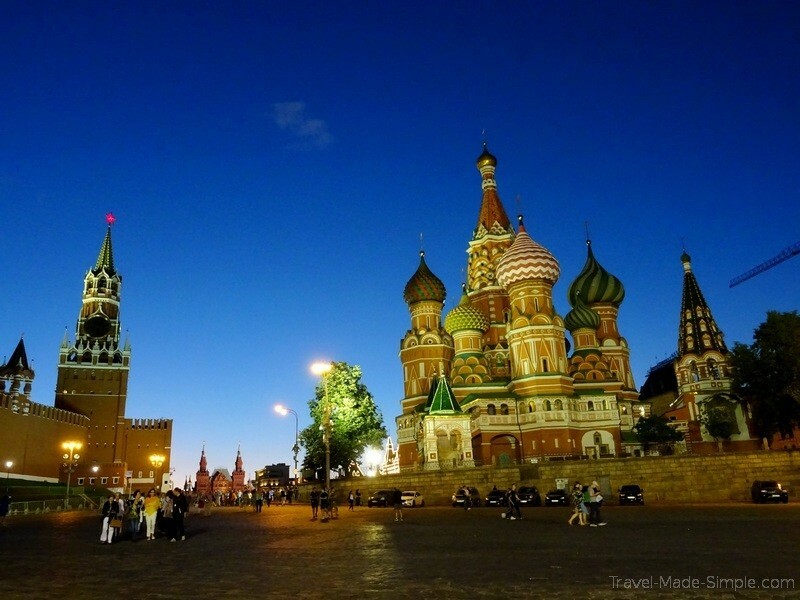 What’s It Like to Take a Russia River Cruise? 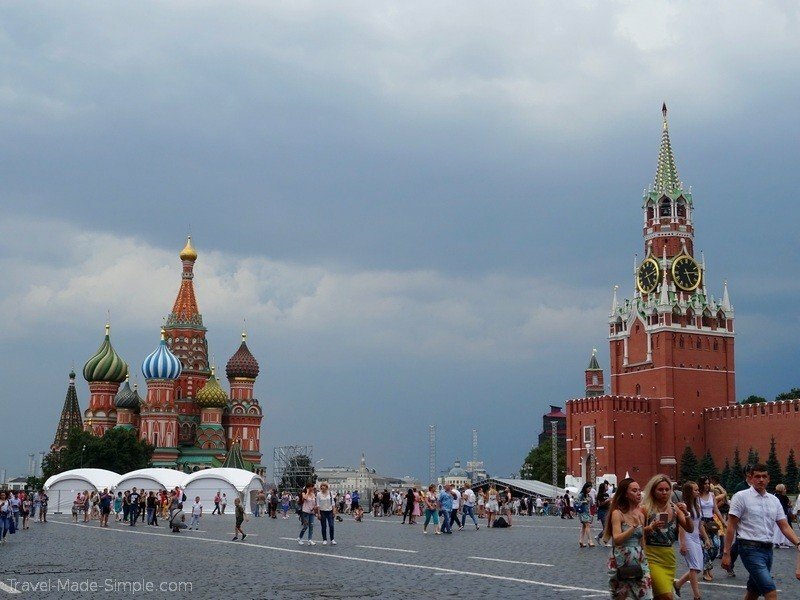 Russia can be an intimidating country to visit for some people. The language is tricky and uses a different alphabet. The visa process is lengthy, complicated, and expensive. And these days, visiting Russia might feel a bit like visiting the enemy. But it’s a fascinating country with lots of history, and it’s definitely a different kind of travel destination. 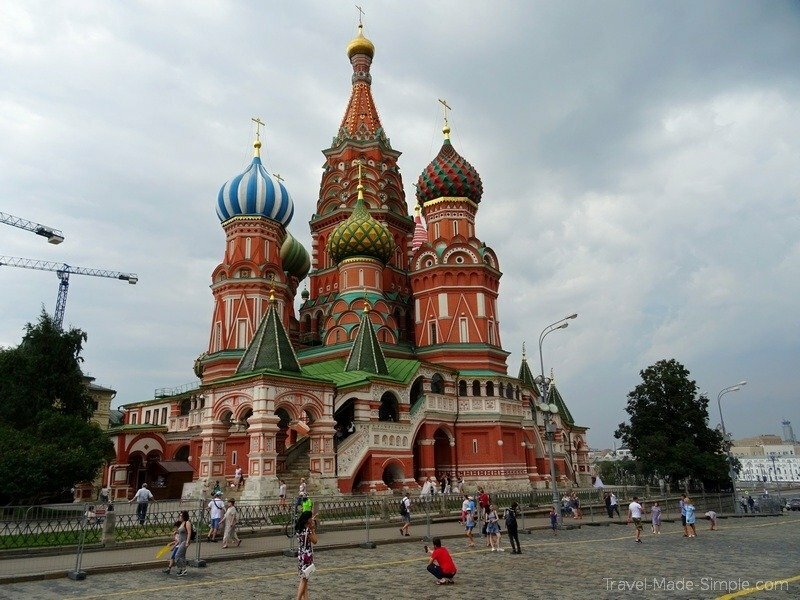 Andy and I recently took a Russia river cruise with Viking – here’s what it was like and what we did in Russia. Like most cruises, our room wasn’t huge, but that’s to be expected. However, it was a really nice room with a comfortable bed, a desk and chair, a closet, and a couple of cabinets where we could store our things. The bathroom was tiny, but manageable. 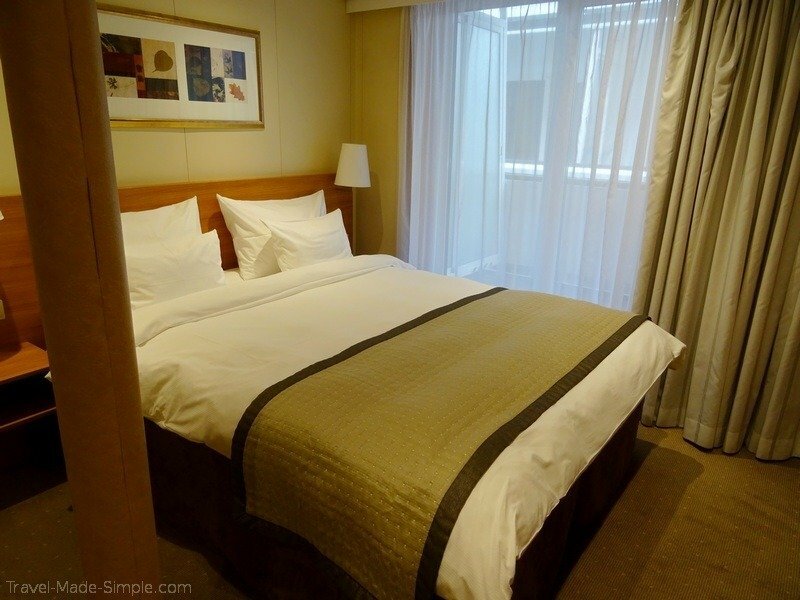 Overall it was a much better room than what I had on the Antarctica cruise I took years ago. Our room was in the section that had balconies, and that was really nice. During daytime sailings, we would often sit out there and watch the scenery go by or watch the boat go through the locks. 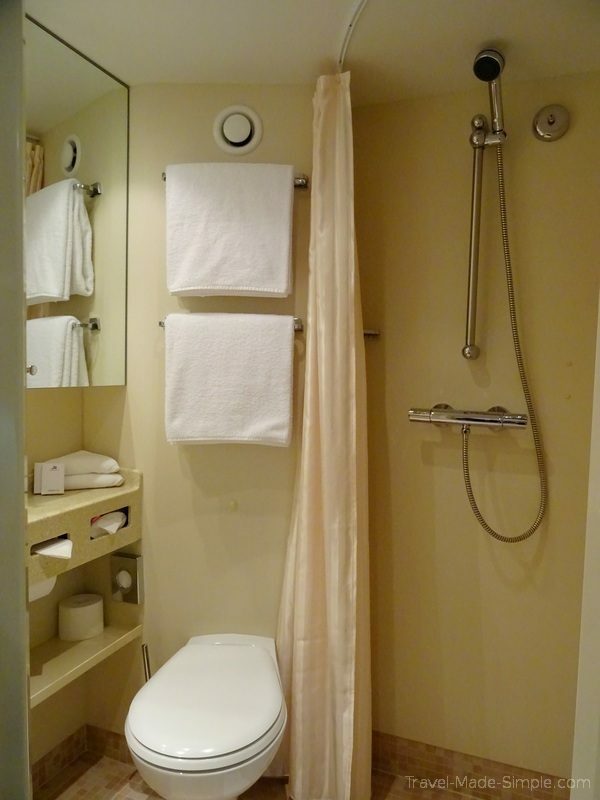 It’s also worth mentioning that the ship was air conditioned, including our stateroom. There was a control that allowed us to adjust it, but we weren’t able to turn it off. Since Andy and I live in Germany and don’t have air conditioning in our apartment, we’re not used to it anymore, so it felt like too much. But if you’re used to being in air conditioning, it might not be a problem for you. River boats are small ships, so you won’t have to deal with crowds of 2,000 people. Our ship held about 200 passengers, which felt like a good amount of people. We were divided up into manageable groups for excursions. Andy and I were probably the youngest passengers on the ship. Viking’s target audience, especially for the Russia trip, is a bit older than us, and I’d say there were, at most 10, people under age 50. The vast majority were 60 and up. Viking also does not allow children. I don’t say this to deter you, but if you’re looking for a younger crowd or a trip you can bring your young kids on, Viking might not be for you. 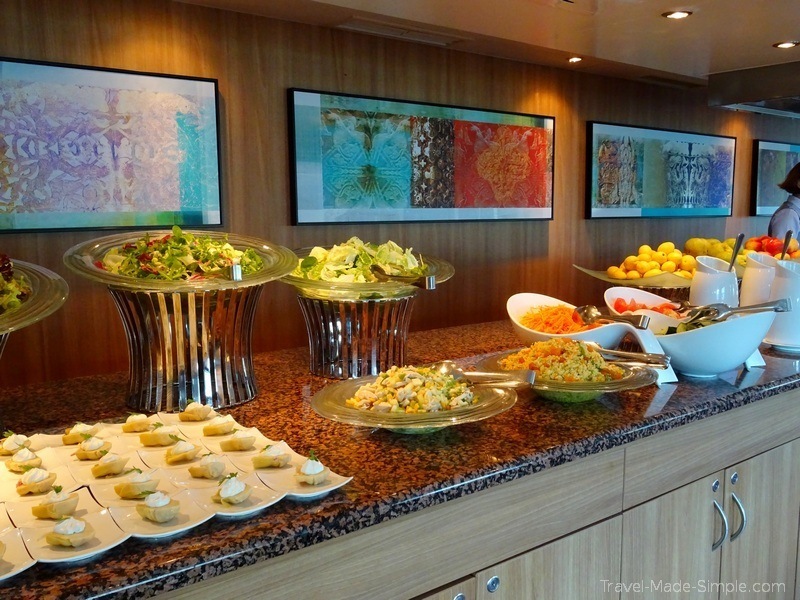 Food was one of my biggest worries about taking a cruise like this since I have so many dietary restrictions. I called Viking well ahead of time and explained that I don’t eat gluten, dairy, eggs, or beans, and they didn’t bat an eye. The customer service rep noted my file and told me the dining staff would work with me while on the ship. This is one area where I think Viking really goes above and beyond. I was introduced to the restaurant manager so they would know who I was. 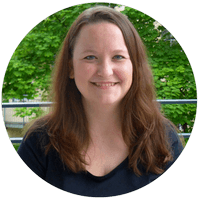 Every morning at breakfast, someone on staff gave me a printout of the day’s lunch and dinner options so I could mark what I wanted and what changes I’d need to make it fit, and they were so good about changing things for me. Aside from that, they had gluten free bread and pasta. 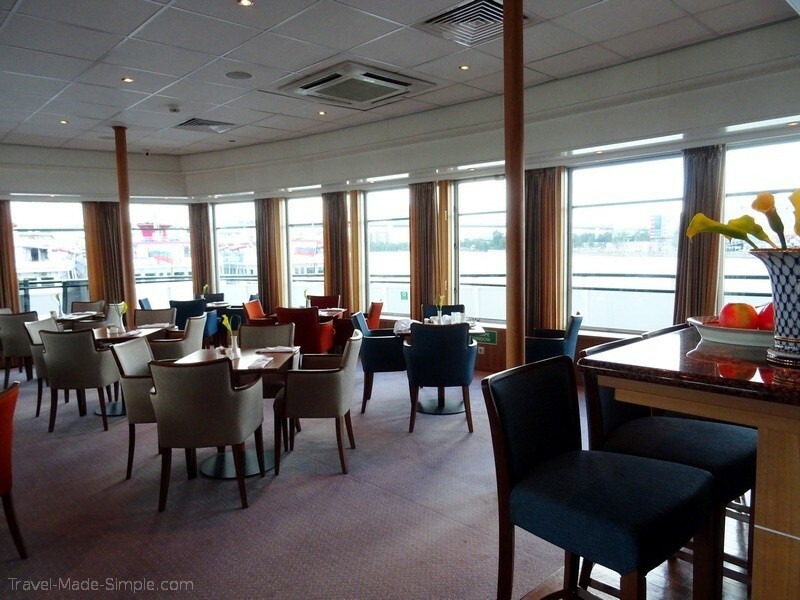 Viking really made me feel comfortable about being able to eat well on their ship. Aside from their wonderful help with my dietary restrictions, the food was really tasty. They always had a meat, fish, and vegetarian option on the menu, and usually these options included local dishes. Plus they had standard items (like a burger or steak, just to name a few) that were available every day in case you weren’t interested in the daily options. At lunch, you could order off the menu or go to the buffet. Coffee, juice, tea, and sodas were included at breakfast. At lunch and dinner, you could get sodas or a small selection of wine or beer, also included. Cocktails and premium wine and beer were extra though. 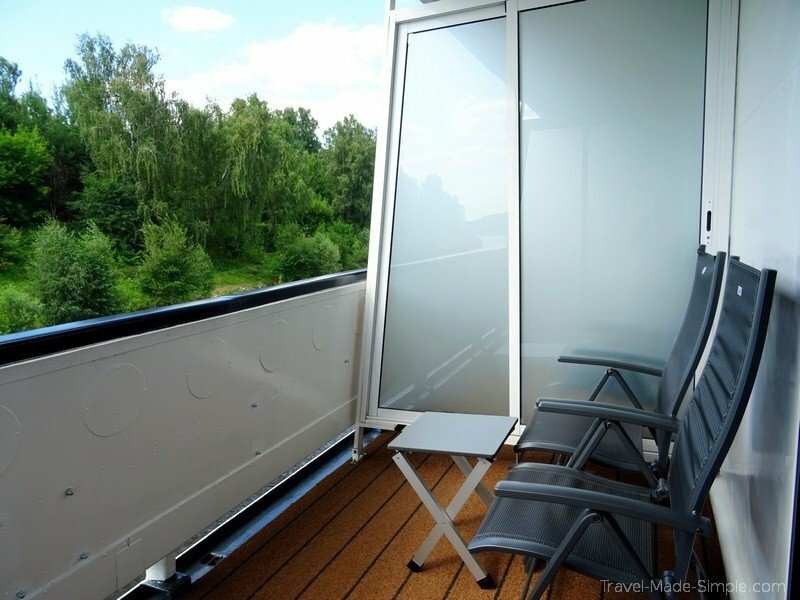 On the upper deck, there was an outdoor section with both covered and non-covered sections. The ship also had a couple of bars where you could go for drinks, and when Andy and I went a few times, it was never crowded. It gave us a good opportunity to talk to the bar tender, which was fun. 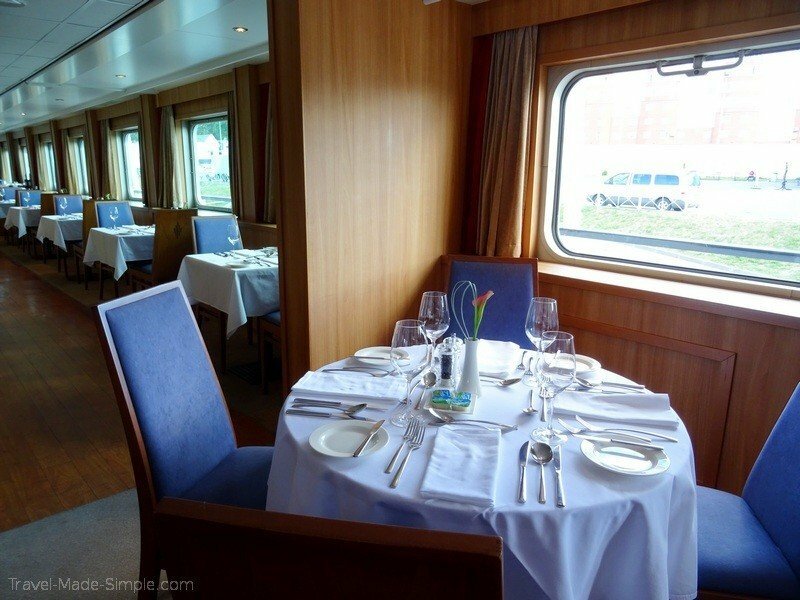 Meal times were set, so the dining room wasn’t open all day long like on a bigger cruise. But there were no assigned seats, which was nice. I enjoyed talking to different people throughout the cruise, or sitting with Andy’s parents or even at a 2 person table for just me and Andy when we weren’t up for chitchat with new people. There weren’t any “at sea” days, so we were docked somewhere every day and could get out for excursions. But there was still plenty to do on the ship. Every day there was a lecture about Russian history or culture, usually relating to the city or region we were coming to next. WiFi was available, but not always great since we were on a moving ship. If you didn’t have your own laptop or other device, there were a few computers available for public use. 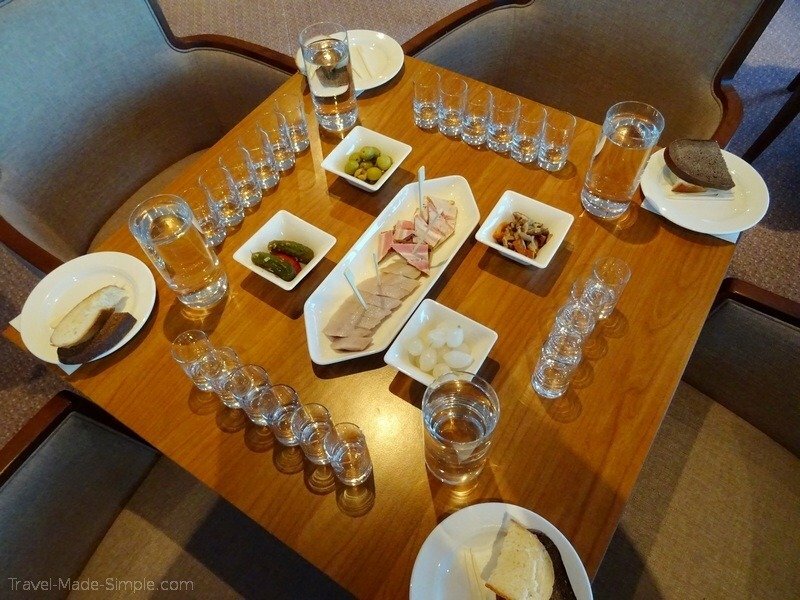 They also had a wine tasting and a vodka tasting (both at an extra cost) and a pelmeni demonstration. 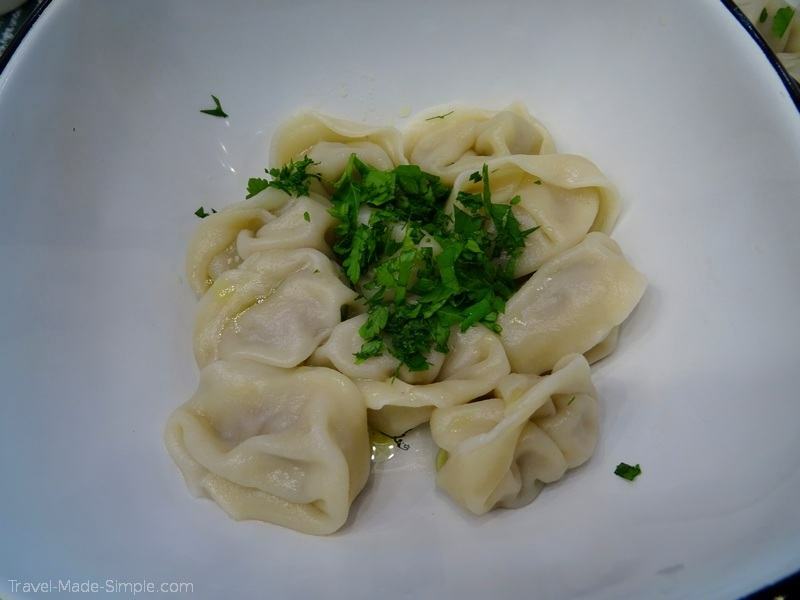 (Pelmeni are tasty Russian dumplings.) These activities took place in the evening while we were sailing or during a longer daytime sailing. Andy and I went to the pelmeni demo and did the vodka tasting. 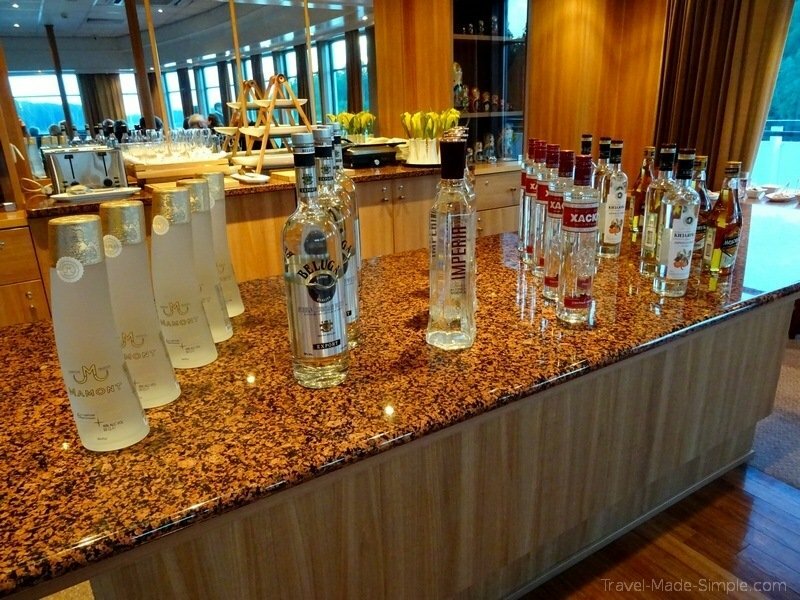 Surprisingly we didn’t like any of the Russian vodkas, even though we quite like Polish vodka. Excursions were available every day we were on the ship. Depending on where we were, sometimes there was only one option, and sometimes there were many options. Certain tours had two different versions, one that had a little more walking than the other, so if you have physical issues that prevent you from doing lots of walking, you could take the one that has you on a bus more. There were tons of excursions that were included with the price of the cruise. But there were a few spread throughout the trip that cost extra. Andy and I paid for a Moscow by Night tour, all four of us paid for the Kremlin Armory tour, Andy’s dad paid for a Cosmonaut excursion, and so on. I don’t think any of us regretted the excursions we paid extra for. As I mentioned earlier, the entire ship was divided up into smaller, more manageable groups for the excursions. That said, the groups were still anywhere from 20-40 people, depending on the excursion, so we had to use headsets to listen to the guide. We opted for the two day Moscow extension, so we actually arrived two days before our cruise started. 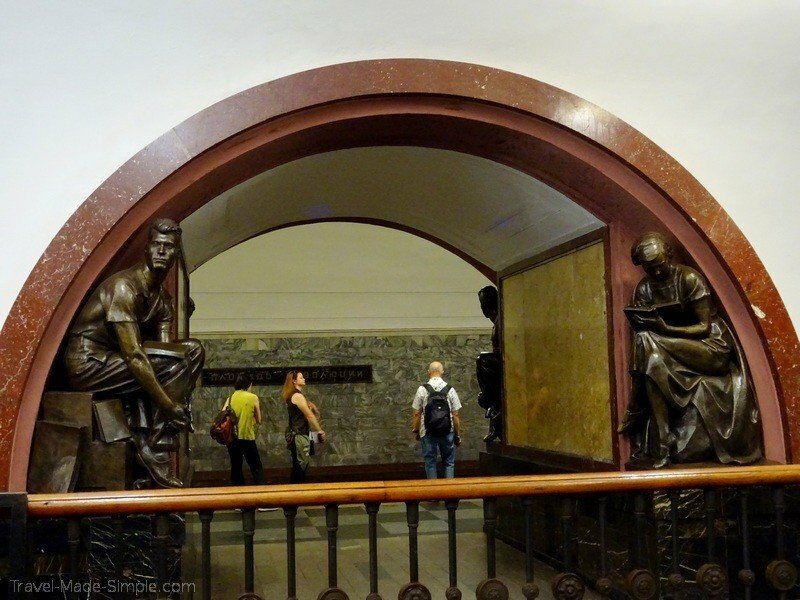 From the hotel, we had an included tour of the Moscow metro system. 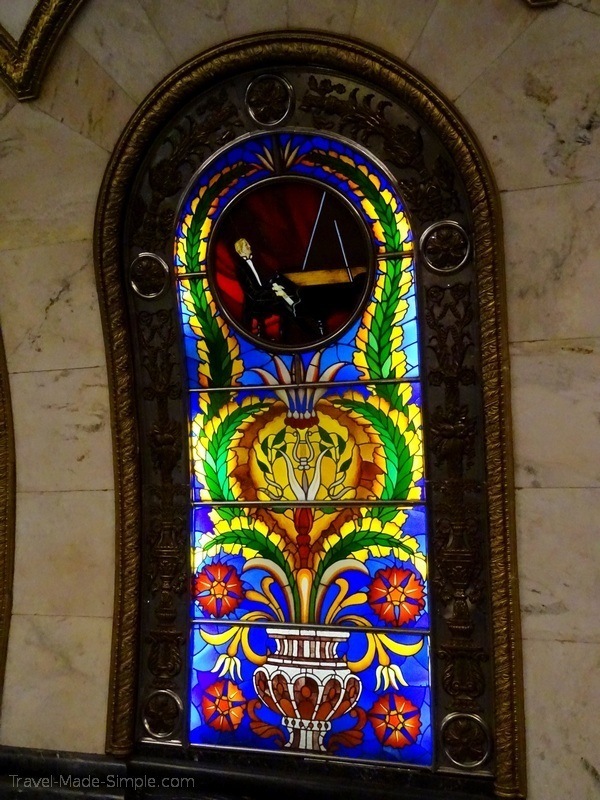 The tour was more interesting than I had expected since many metro stations are actually very ornate. Our guide told us about some of the quirky statues and decorations in some stations as well as how to use the trains. And while I normally like using the metro/subway when I travel, they were extremely loud in Moscow and gave me a headache. Since we had lots of free time after the metro tour, Andy’s dad played tour guide and took us around to some of the places he had researched before the trip. First we went to the GUM, a famous department store near Red Square, and had lunch in a cafeteria style restaurant, followed by a quick look at Red Square itself. 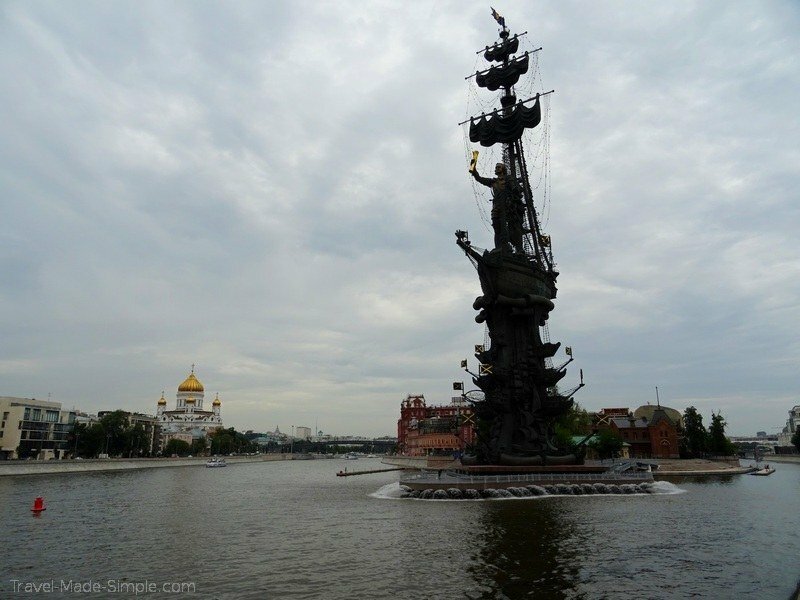 Then we went over to the river to see a giant statue of Peter the Great that’s on an island in the middle of the river. It’s kind of obnoxiously big. 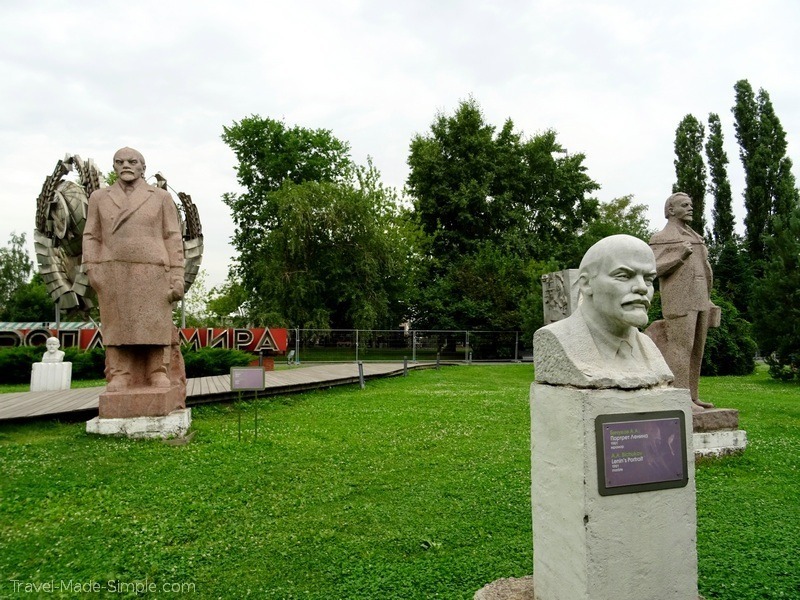 Nearby was a park that is loaded with statues, most of which are from the Soviet era. There were sections with multiple Lenin or Stalin busts and statues. 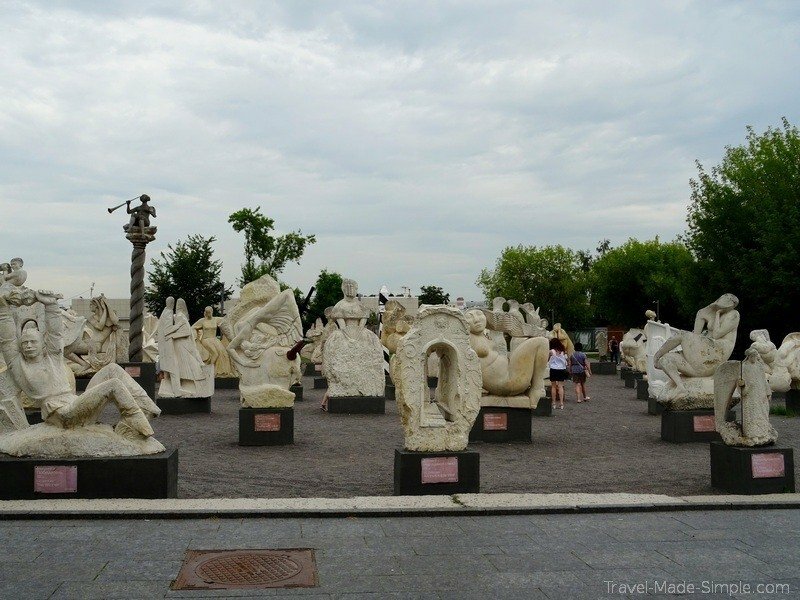 There was even a section that basically looked like a statue graveyard because there were rows and rows of them. Andy and I love food tours, and it seemed like the perfect activity for our last day before getting on the boat. It turned out to be just me, Andy, and his parents, along with the guide, so it was a fun experience. This was not at all connected with the cruise. We ate tons of interesting Russian food! I definitely cheated on my dietary restrictions to eat pelmeni with sour cream. 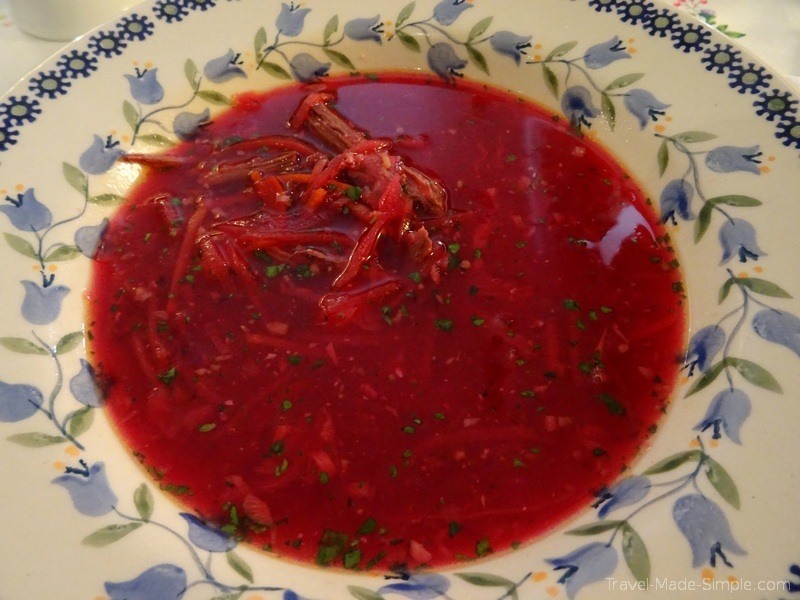 We also had borshch, which is a beet soup that I’m surprised I liked. Although it was served with a mayonnaise-based salad that I did not enjoy. 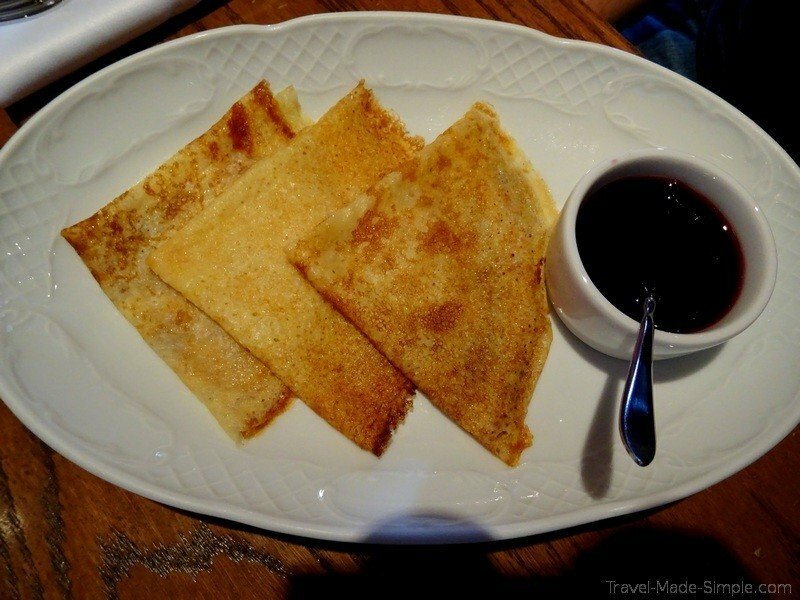 At one restaurant, we had the choice of either kasha, which is like milk rice, or blini, which are like crepes. At the end, we needed to leave a little early to get back to the hotel in time for our transfer to the ship. Instead of sitting down, we ordered piroshky (pastries with fillings) to go, though I had already had my fill of bready things by then, so I skipped it. Overall, I’m so so glad we did this tour! I loved most of the food, and it gave me a great introduction to Russian cuisine, making it easier to make food decisions over the next two weeks we were in Russia. 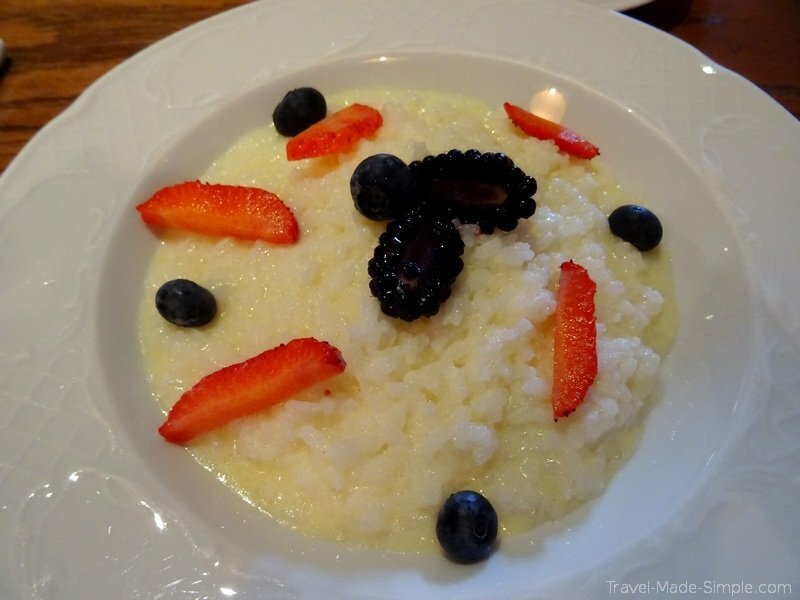 I highly recommend the Eat Is Moscow Traditional Russian Cuisine Tour. I’ll be honest, Viking’s Moscow city tour excursion didn’t sound too interesting to me and Andy, although this was mostly because it included a lot of things we did/saw on our own. Andy’s parents went and enjoyed it, but Andy and I decided to skip it and have a day on our own. 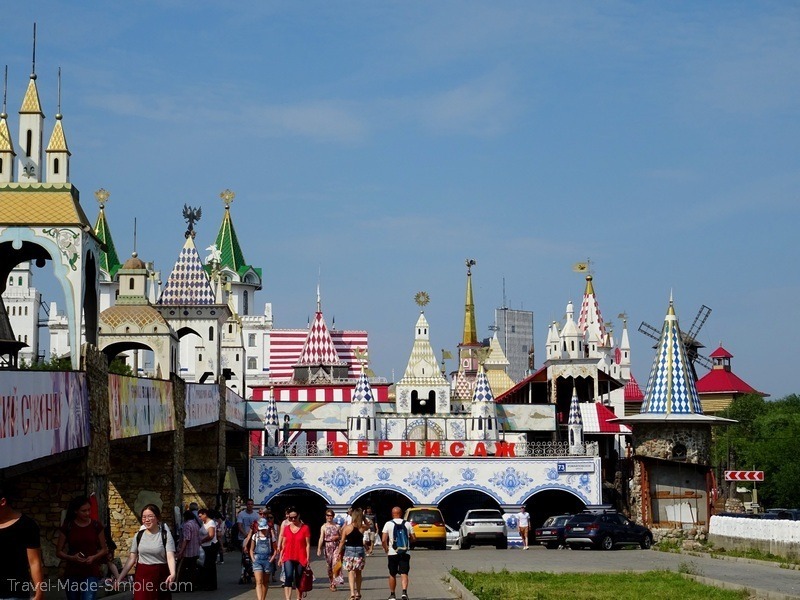 We had read about a flea market called Izmailovo Market that sounded quirky and interesting, so we went there and wandered around for a bit. It was one of the hottest days of our trip, so that kind of put a damper on the whole experience, but it was still fun. Then we went back to Red Square, coincidentally at the same time as Andy’s parents’ tour group was there, and got a few more pictures. 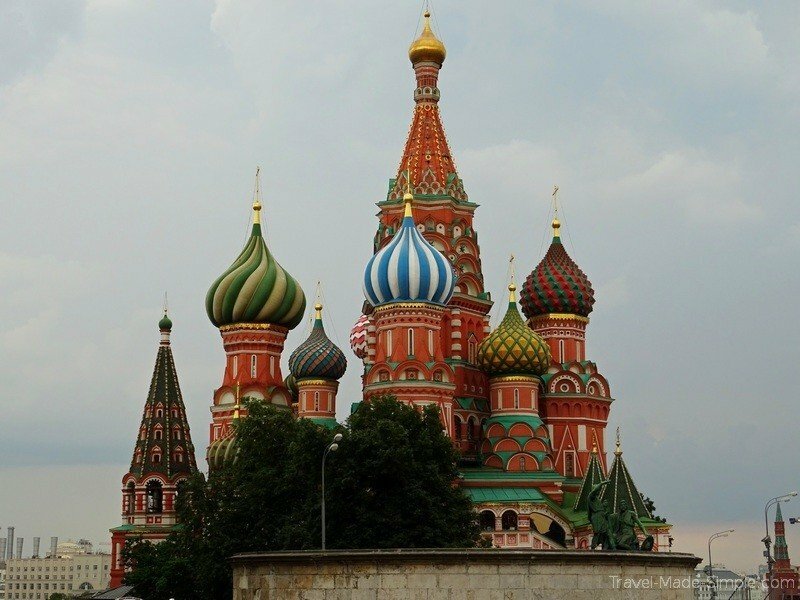 We didn’t have much interest in going inside St. Basil’s Cathedral, but it’s a gorgeous building from the outside. One of the optional excursions Viking offered was a Moscow by night tour, and Andy and I signed up. Once again, we ended up at Red Square, but seeing it at dusk was really wonderful (though still super crowded). The tour also included a scenic boat ride that passed by several points of interest, including that giant Peter the Great statue. 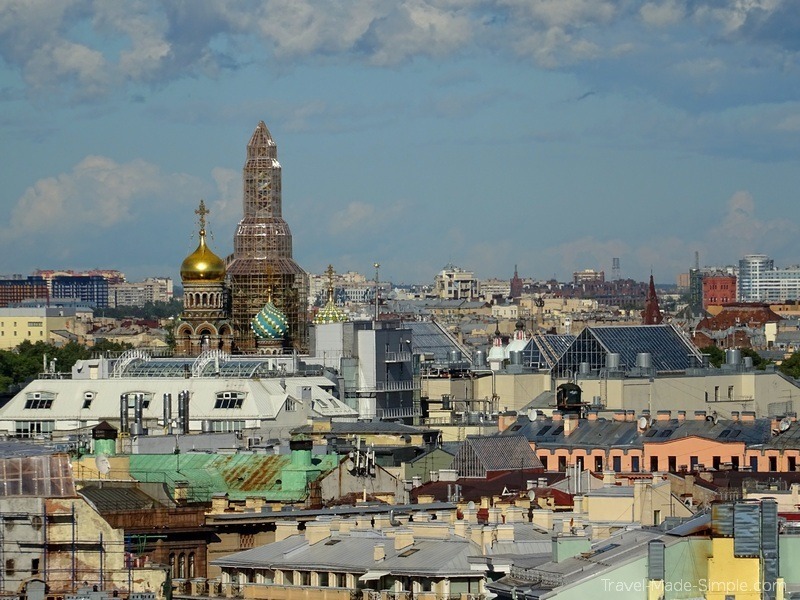 Supposedly it wasn’t originally built to be Peter the Great – it was supposed to be Christopher Columbus. But the artist couldn’t find an American buyer and instead repurposed the statue as Peter the Great. According to Wikipedia, the artist denies this story. Regardless, it’s a ridiculously tall structure (one of the tallest statues in the world at 322 feet) and locals think it’s ugly. Our guide took us to a few other lookout points with nice nighttime views, but I didn’t enjoy them as much. But I thought the tour was worth it just for the boat trip and the end-of-day light at Read Square. Faberge eggs and other bejeweled items, old carriages, and fancy clothing all lined the displays. Our guide told us interesting stories, like how the royal women who wore those dresses would be strapped in so tightly that their waists would measure around 19 inches, and they could barely breathe, leading to all kinds of ailments. Fun times. Back outside, we saw a few churches (one that our group went into), a big bell that was cracked before it ever got rung, a big cannon, and the impressive grounds of the Kremlin. After several days in Moscow, our ship departed and sailed to Uglich, the next stop on our Moscow to St Petersburg cruise. Once there, we took a walking tour of a section of town with several churches. They were pretty, but honestly, I was already getting over-churched. But after the walking tour, we were further split into smaller groups and brought to the homes of locals. About a dozen of us got to meet a Russian woman who lives in Uglich, and our guide translated her questions for us. She had a spread of tomatoes, pickles, potatoes, bread, cake, tea, and homemade liquor for us to taste. Everyone had a few bites of food, but I LOVED those pickles! 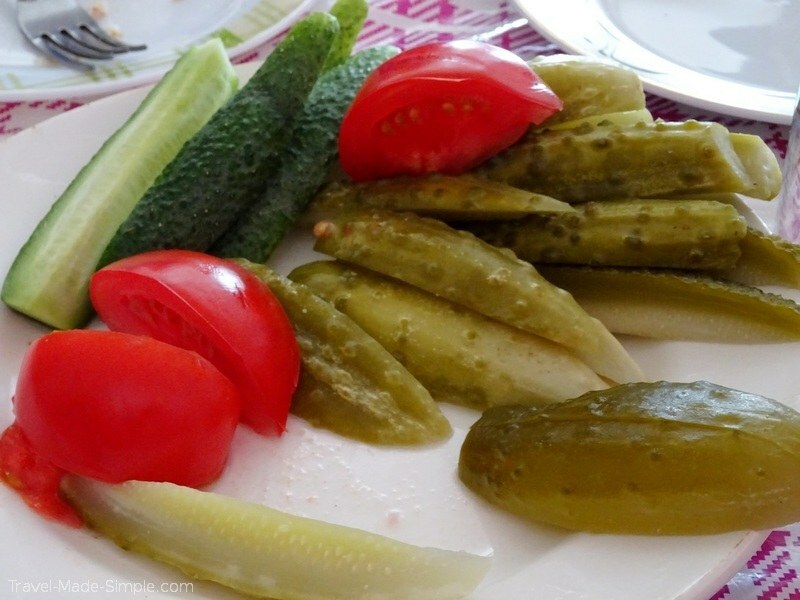 They were real fermented pickles, and since no one else ate more than a few, I dug in and pretty much ate two or three big plates of them myself. I was a little skeptical of the home visit ahead of time, but it turned out to be one of my favorite things on the cruise. Even though the language barrier prevented us from having in-depth conversations with her, it was so interesting to have this experience. It was a fantastic addition to the normal touristy stuff. 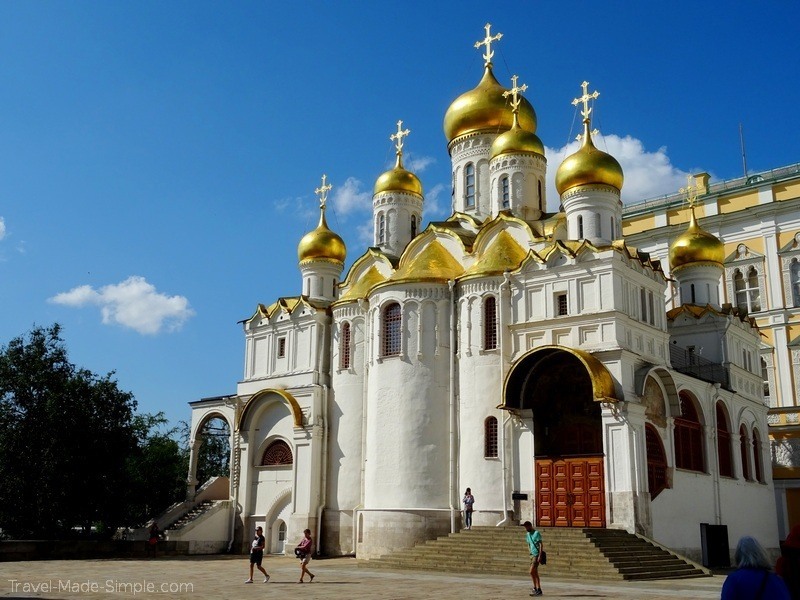 Yaroslavl was a pretty big city, but the city tour included with the cruise didn’t really appeal to us. We needed some time away from the group, so we decided to wander on our own. The indoor market was fun, and we bought an assortment of chocolates from a vendor there. There was an outdoor market too, but it was mostly clothing and shoes. Our next stop was a small town called Kuzino, and unfortunately I don’t have much to tell you about it. The planned excursion was a visit to a monastery followed by a school visit. I already mentioned we were getting burnt out on churches, so the monastery didn’t appeal to us, and somehow the school visit, at a time of year when children aren’t in school, felt awkward. Andy’s parents really enjoyed it, so maybe my hesitation was unfounded. In any case, Andy and I stayed on ship that day. Due to logistics, the ship dropped everyone off at one location and picked them up a few hours later at another location, so it really wasn’t possible for us to get out and look around on our own. But it meant we got to enjoy a quiet ship with almost no other passengers, and we got to see the crew doing a big group photo. 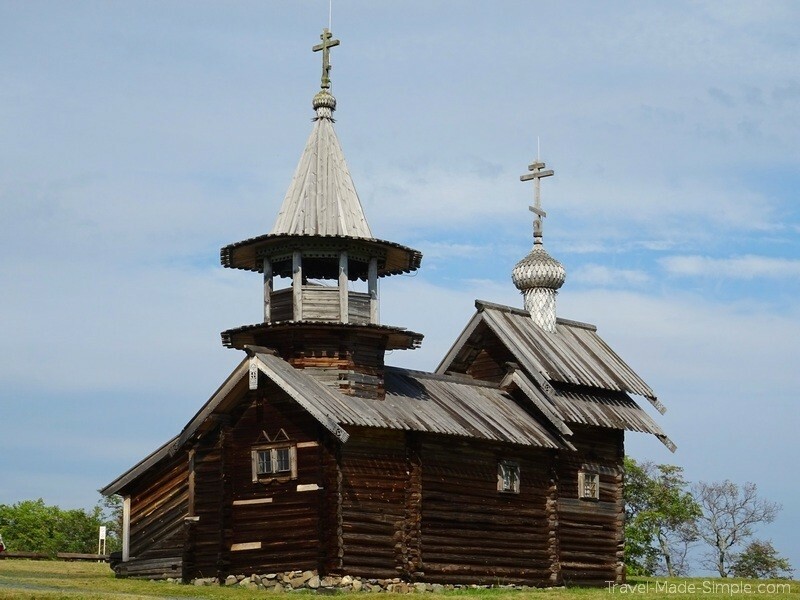 Kizhi is an island that’s basically set up as a big open air museum. It shows what life would’ve been like for the people who lived there 100 or so years ago. There were wooden buildings, including a big church that was being fixed up, and homes set up to show what the insides looked like. Plus there were some employees (um, actors?) who sang songs and weaved cloth to give life to the place. 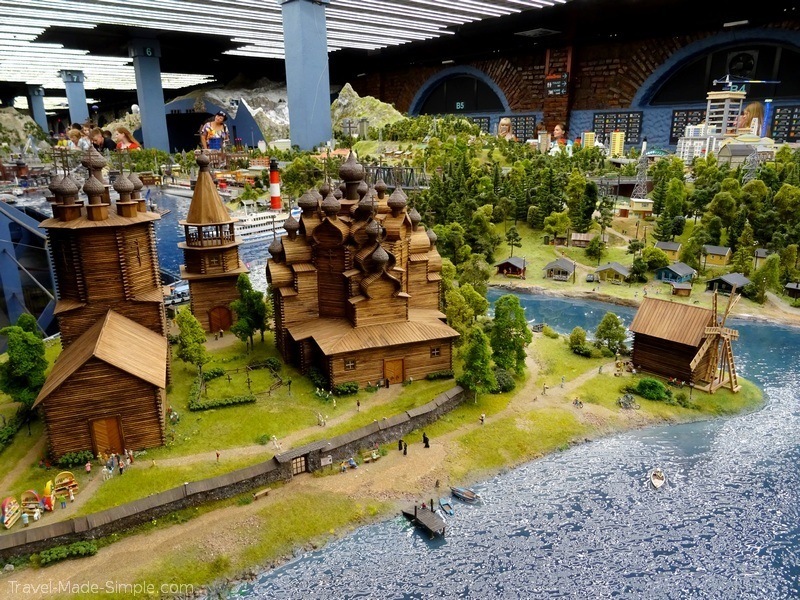 Normally I would’ve thought the life they were depicting was from way more than 100 years ago, but apparently this area of Russia was very isolated. 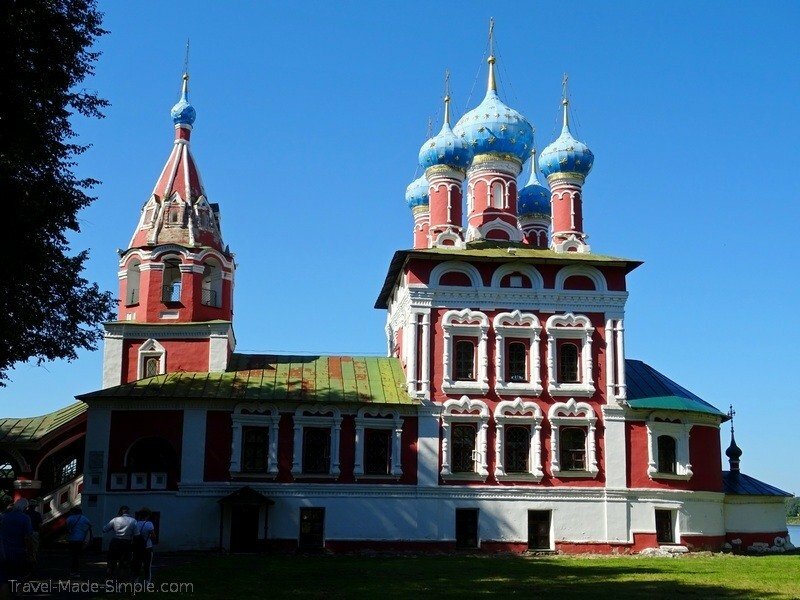 Kizhi turned out to be one of my favorite stops on the Russia river cruise. 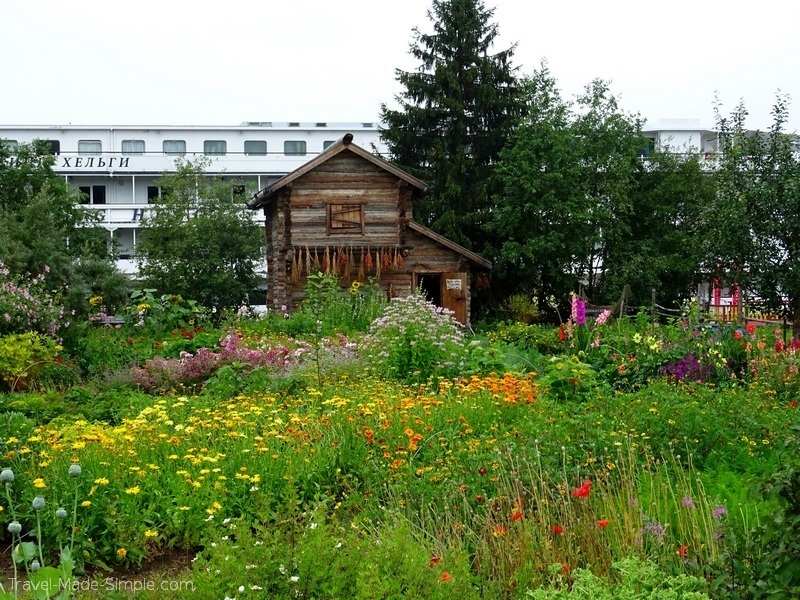 Mandrogy, our last stop before St Petersburg, was another open air museum village. Andy and I wandered around on our own, mostly enjoying the quiet nature of the place once we got away from the real village-y section. 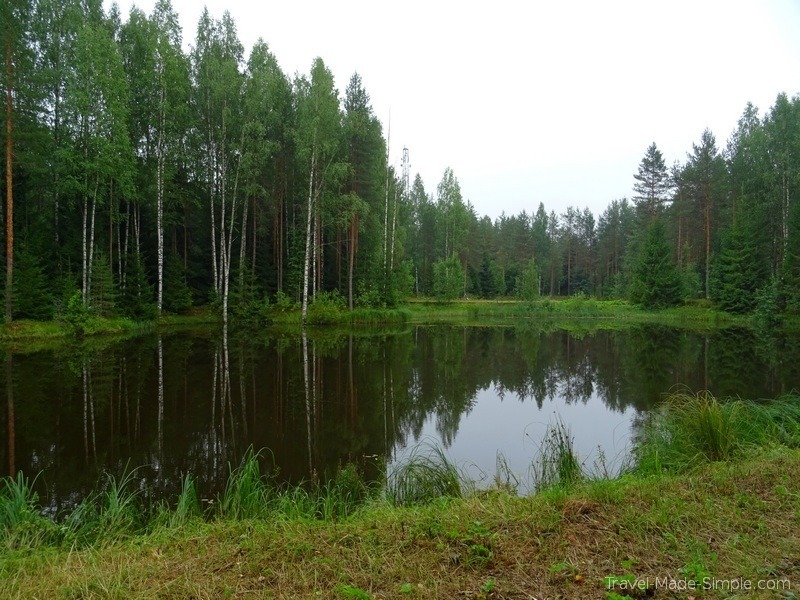 But there were planned activities for those who were interested: You could’ve gone to a traditional spa where they basically whack you (supposedly lightly) with birch branches, or you could’ve painted a metrishka doll. Neither was appealing to us, but we did enjoy our walk. 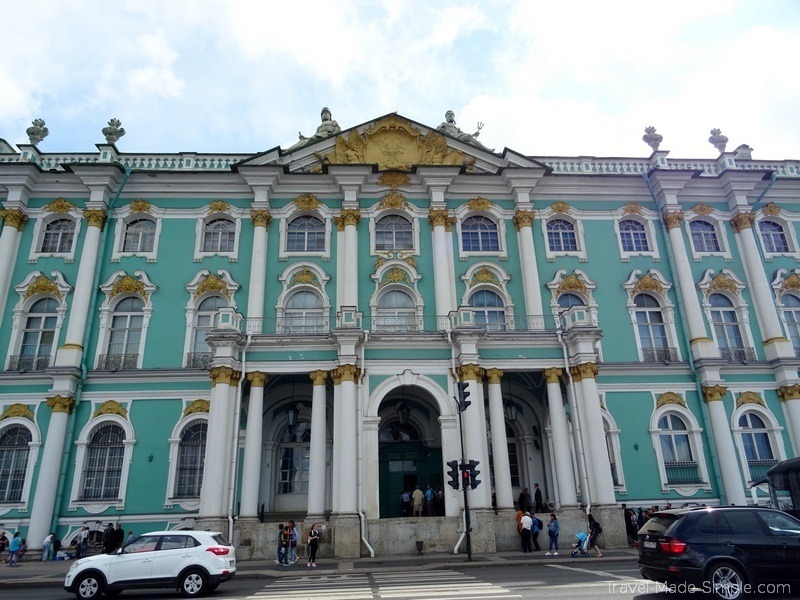 The first day in St Petersburg was an included visit to the Hermitage Museum. I know I’m sounding like a broken record here, but we skipped it. I know, it’s one of the most famous museums in the world, how could I skip such a place? Sorry, I’m not an art museum person, plus the art isn’t even Russian art. Instead, Andy and I went into the city ourselves. We did get to see the outside of the building…with an insane line of people outside, an indicator that we made the right choice by skipping the hoards inside. That night, we went to a ballet. 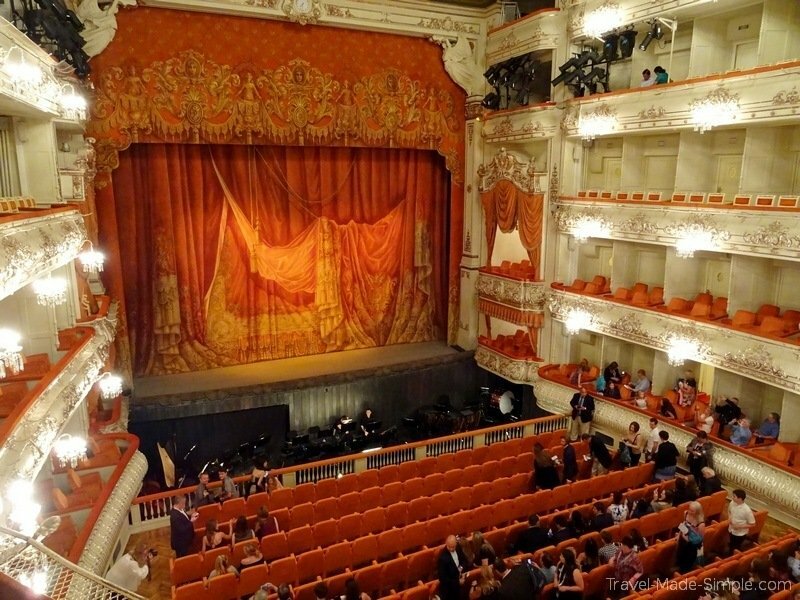 Since St Petersburg is also well known for ballets, I had high hopes for this, and while it wasn’t horrible, it wasn’t the best either. The few ballets I’ve seen in the past were interesting to watch because of the music and the beauty of the dancing, but the story was simple and easy to follow despite the lack of words. And even if you didn’t follow the story, I never felt it was necessary. 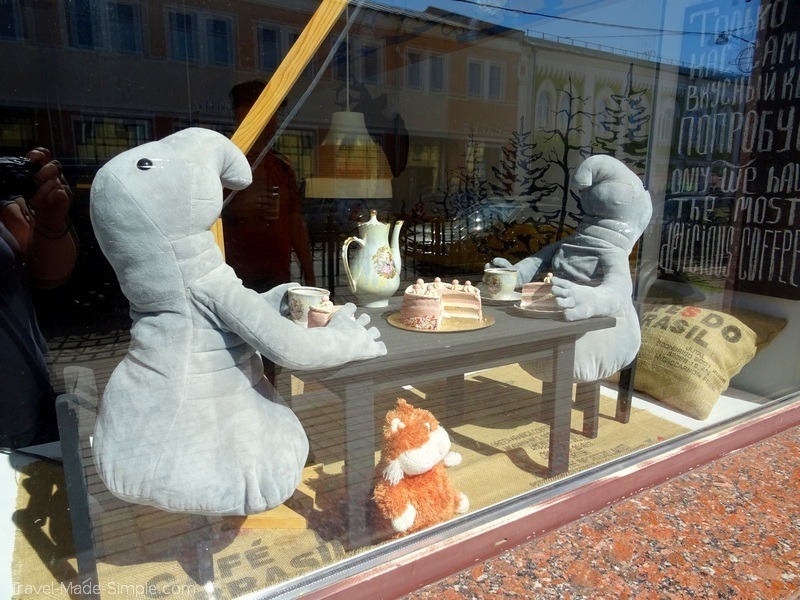 But the one we saw in St Petersburg was tricky to follow without dialogue. I didn’t exactly know what was going on the whole time, and it was a little annoying. My other issue was the theater itself. I probably shouldn’t have been surprised, but they seemed to be catering exclusively to big tour groups like ours. This made it feel a little less authentic to me. Maybe that’s just easier than bringing 200 people to a “normal” theater, but I would’ve preferred to go somewhere the locals might go. However, if you’re interested in seeing a ballet and you’re less cynical than we are, you might really enjoy this. 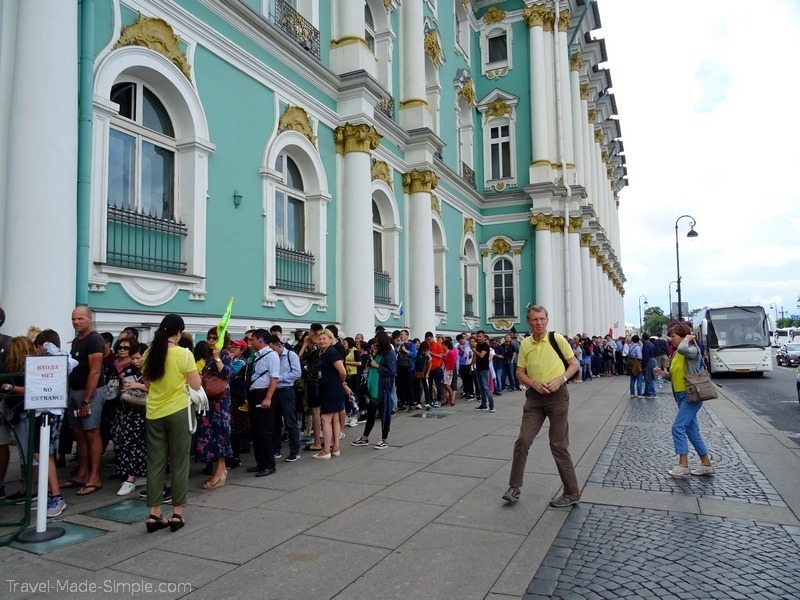 The city tour we took in St Petersburg brought us to a handful of and sights. We saw the famous Church of the Savior on Spilled Blood (one of many “spilled blood” churches we visited while in Russia) though we didn’t have time to go inside. 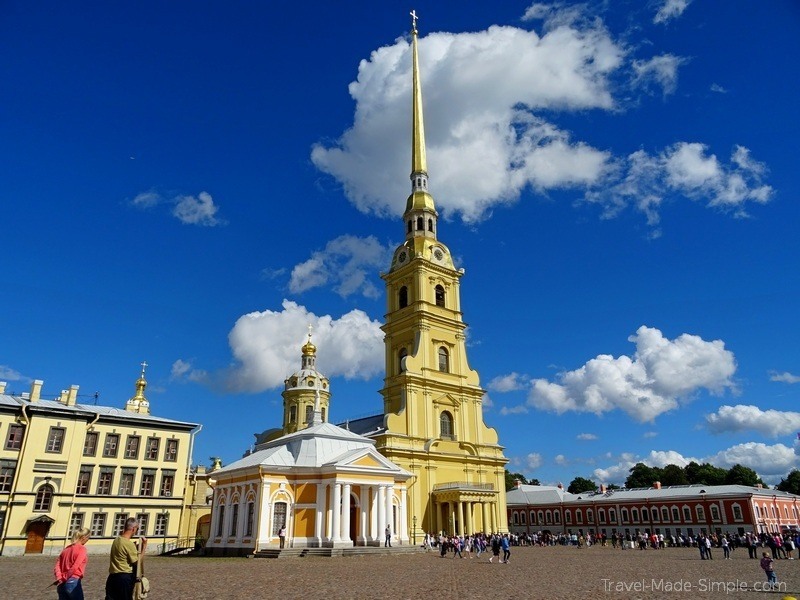 Next we visited the Peter and Paul Fortress, but technically the church located there. 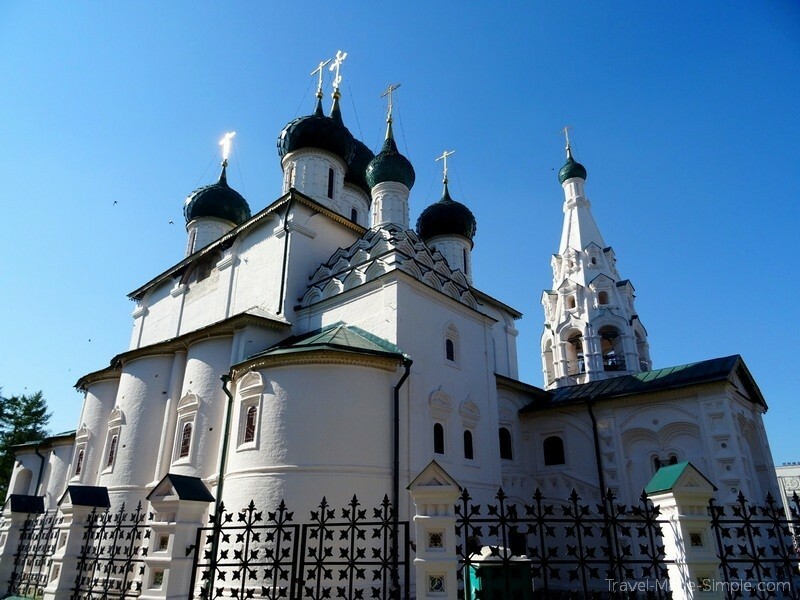 Inside the church are several tombs, and many of the Romanovs are buried there. It was really interesting to hear the stories our guide told us about them. Towards the end of the tour, our guide gave us free time near St Isaac’s Cathedral. Since Andy and I love views of cities from above, we climbed church tower, along with Andy’s dad. The views were really great, but we had to battle our way through the crowded viewing platform and navigate people who thought it was more important to take 50 selfies in one spot than to take a couple and let others see the view. 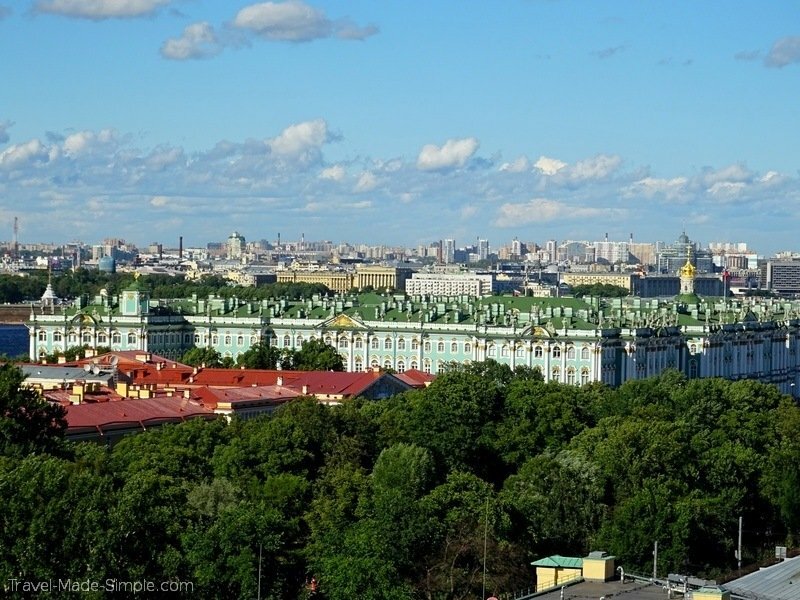 After disembarking from the ship, we transferred to a hotel near St Isaac’s Cathedral to start our two day St Petersburg extension. A city tour was included with the extension, but it sounded so similar to the city tour we had already taken while still on the ship, so the four of us skipped it. But Andy found a place in St Petersburg called Grand Maket. 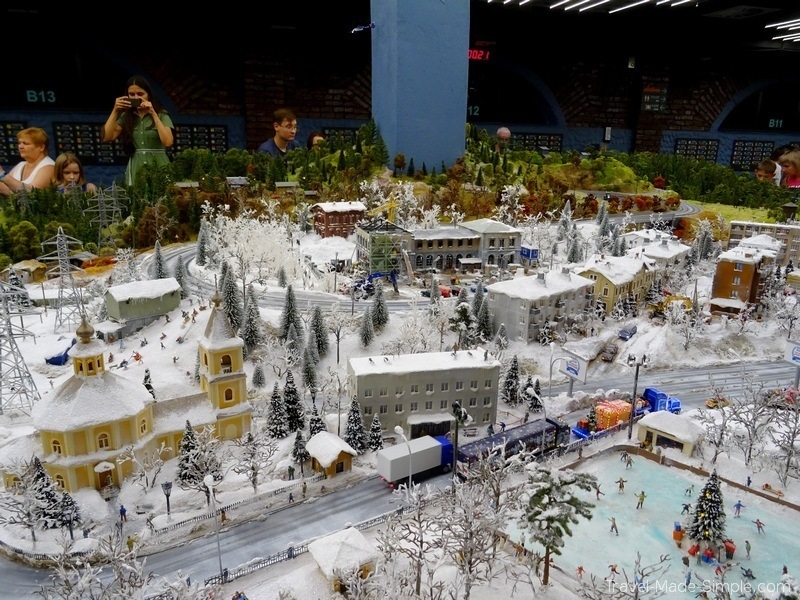 It was very similar to Miniatur Wunderland in Hamburg, Germany, except it was Russia in miniature. It covered Moscow, St Petersburg, and sooooo many other places throughout the country. The detail was just as good as the place in Hamburg, and we had lots of fun looking around. Highly recommended. 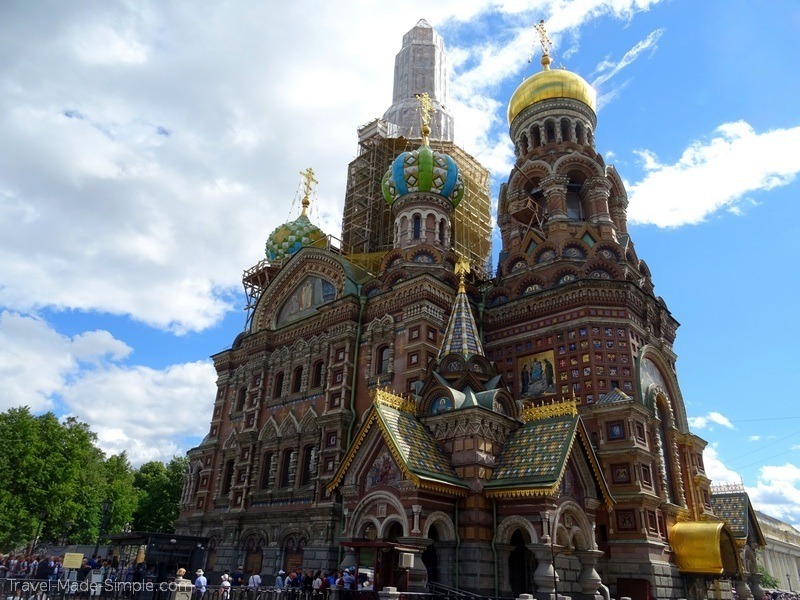 After 16 nights in Russia – 12 nights on the Moscow to St Petersburg cruise plus 2 nights for each extension – Andy and I hopped on a train bound for Helsinki. 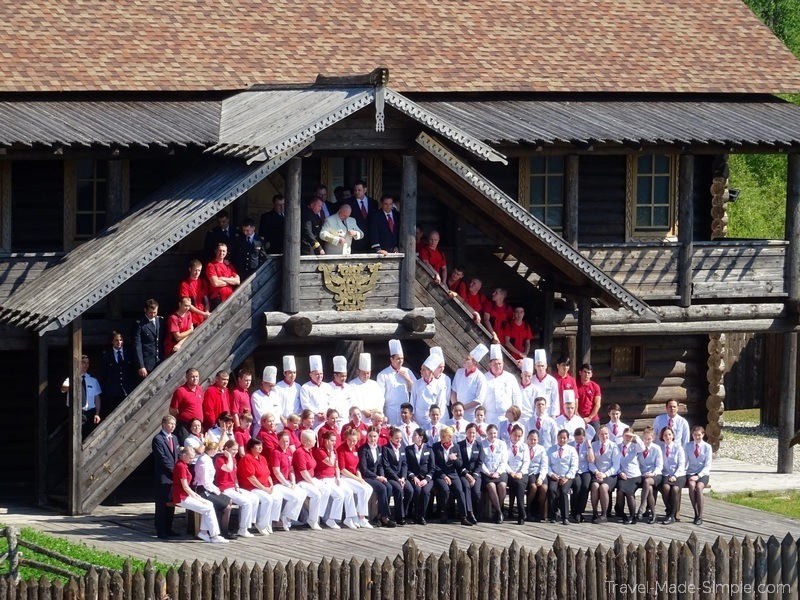 Overall we had a good experience traveling through Russia with Viking River Cruises. 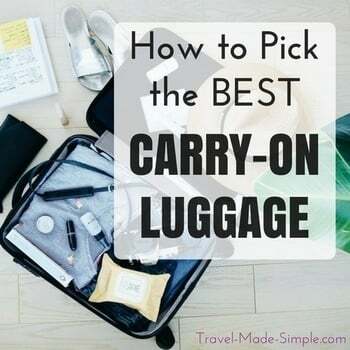 It might have been a little constraining for me and Andy since we’re so used to traveling on our own, but I’d definitely recommend them for a more mature traveler who wants an organized tour with a classy touch of luxury. 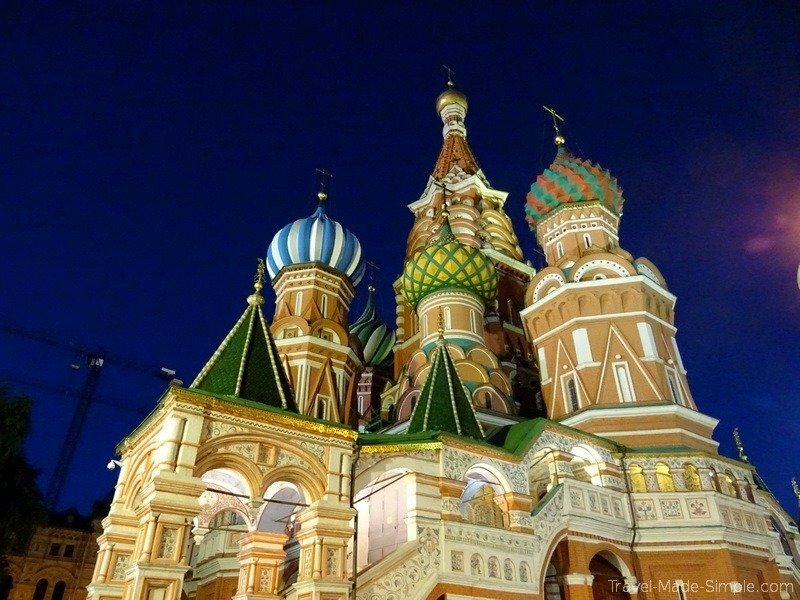 For more info and to book a Viking Russia river cruise, click here.